The 2014 Sydney International Women’s Jazz Festival is proud to present the exclusive Australian debut of the great Chicago jazz singer Dee Alexander. Dee’s flawless intonation, interpretive brilliance, intrepid improvising and command of a wide range of genres places her as one of America’s premier vocalists. She has received critical acclaim in jazz press around the world with her last two albums receiving five star reviews from DownBeat. Since the release of her 2009 album Wild Is The Wind, Alexander’s name appears in the programmes of prestigious European and American jazz festivals. Her style underscores her lineage of, and inspiration from the great African American jazz singers such as Sarah Vaughan, another Chicago native and Dinah Washington. Her contralto voice has power, range and a lush, velvet quality. 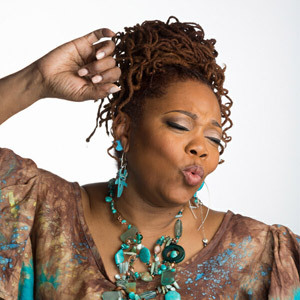 Dee is recognised as one of the most gifted and versatile vocalists alive, a shining example of the famous Chicago jazz tradition. She is fearless in taking risks to bend the material to the contours of her own imagination. Her highly anticipated “Songs My Mother Loves” has recently been released. For her Australian performances Dee is accompanied by her musical director, pianist Miguel de la Cerna.